Lamictal is the brand name for the generic drug lamotrigine, an anticonvulsant agent. Like other antiepileptic drugs, Lamictal works to block sodium channels, which serves to decrease abnormal or unwanted electrical activity in the brain and prevent the rapid neuron firing that causes seizures. This function also allows the drug to increase the amount of time between episodes of mania and depression (though it does not affect the manic-depressive episodes themselves while they are occurring). Lamictal ODT, Orally Disintegrating Tablets: 25 mg, 50 mg, and 100 mg.
Lamictal ODT uses technologies intended to mask the bitter taste of the medication and to hasten drug dissolution. Patients characterize the taste as favorable. Lamotrigine is also available as a generic drug. Some of the companies that manufacture generic lamotrigine include Teva Pharmaceuticals, Cadistam Mylan Pharmaceuticals Inc., Northstar Rx LLC, Westward Pharmaceuticals, and Unichem Pharmaceuticals. In 1994, the U.S. Food and Drug Administration approved Lamictal as an adjunctive treatment for partial seizures in adults, although in practice, it is commonly used alone for treating this condition. 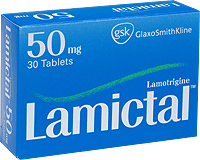 Lamictal is used to treat epilepsy and bipolar disorder. In the case of epilepsy, Lamictal is prescribed to combat partial, primary, and secondary seizures, as well as seizures arising from Lennox-Gastaut syndrome. Lamictal has also been proven to be a relatively effective mood stabilizer, which is why it is often used to treat bipolar disorders. Lamictal may also be prescribed alone for treating partial seizures in adult patients when shifting from other anti-epileptic drugs such as valproate and divalproex sodium. Lamictal is also the first medication after Lithium that was approved for the management of Bipolar disorder (manic depression). This medication may also be used for other medical purposes depending on your healthcare provider’s evaluation. These include depression, migraines, neuropathic pain, PTSD, and schizophrenia (though these are considered “off-label” uses). Before initiating Lamictal, be sure to inform your healthcare provider is you are allergic to lamotrigine or other anti-seizure medications, have liver or kidney problems, or have history of suicidal thoughts and depression. Lamictal is associated with life-threatening skin rash, especially in younger patients and those taking high doses of Lamictal. Co-administration with valproic acid (Depakene) and divalproex (Depakote) increases the risk for serious skin rash. Watch out for any signs of skin rashes or allergic reaction such as swelling in your face or tongue, sore throat, fever, skin pain, burning sensation in the eyes, purplish or reddish skin rash that can lead to peeling or blistering. If you notice any of these symptoms, seek medical attention right away. Lamictal may cause suicidal thoughts. Regular physician visits are necessary to check for possible suicidal thoughts. Discuss with your healthcare provider any psychological changes, such as: anxiety, depression, mood or behavior changes, feeling of hostility or restlessness, or recurrent thoughts about suicide or injuring yourself. Continue taking Lamictal even if you feel well. Suddenly stopping Lamictal without consulting your healthcare provider may increase seizures. Contact your healthcare provider if your symptoms get worse even after starting Lamictal. Inform your doctor if you become pregnant or plan to be pregnant while taking Lamictal. This medication increases the risk of cleft lip or palate.